is an international human rights NGO which is comprised by human rights activists from around the globe. Citizens Rights Watch is utilising new technologies, and through online activism and digital advocacy, is raising awareness of citizens rights, focuses on educating citizens about their rights & on inspiring citizens to become activists, while advocates through all media possible for citizens’ rights internationally. Join us by signing in our Website, follow us on Twitter or connect with as on Facebook, stay informed & take action with us! Join our fights for human rights for all, everywhere & forever! 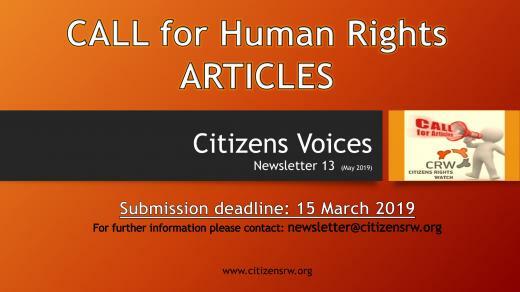 We call everyone with relevant experience or a keen interest on human rights to write for our next CITIZENS VOICES: online human rights magazine No. 13! · We particularly welcome volunteers, activists, academics, students, groups, NGOs, academic institutions and concerned citizens to share their expertise, views, thoughts and experiences with us! Write about a human rights issue that you want to raise awareness about, promote a citizens cause, a petition, or file a complaint. CITIZENS VOICES, is a platform for all citizens to use, and advocate for citizens rights. · Authors are free to choose their topic - Write about any human rights and citizens rights issue you would like to discuss, address or raise awareness about. · Articles should be between 500-1500 words. · All submissions must be original, and exclusive to Citizens Rights Watch (CRW). · We will not consider articles that have already been published (in print or online). · Articles may be submitted in Word Format directly to the CRW Content Editor, Athanasia Zagorianou (newsletter@citizensrw.org) by 15th of March 2019. · Please include your full name, email address, the title of your article and a short bio (max. 50 words) at the top of the first page. · CRW also accepts letters for publication, including citizens’ complaints! Letters/complaints should preferably be between 120-200 words.